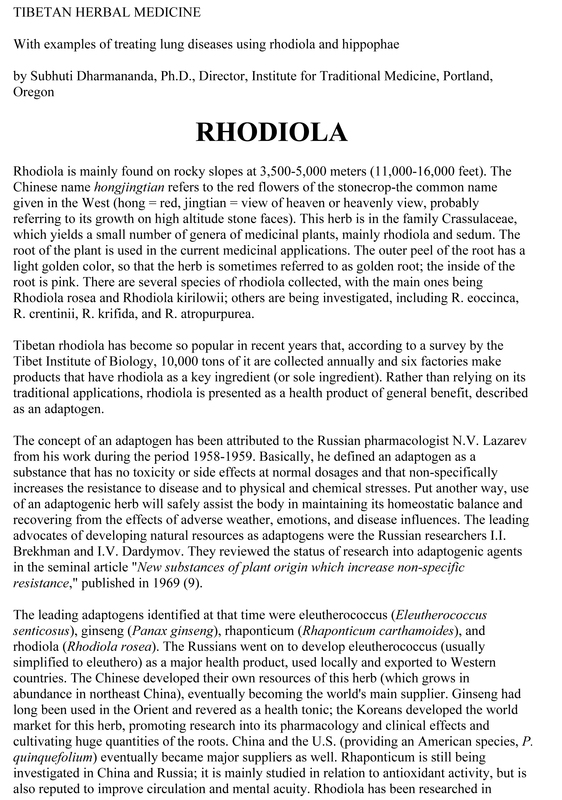 Rhodiola rosea (“golden root” or “Arctic root”) is widely distributed at high altitudes in Arctic and mountainous regions throughout Europe and Asia. It is a popular plant in traditional medical systems in Eastern Europe and Asia, with a reputation for stimulating the nervous system, decreasing depression, enhancing work performance, eliminating fatigue, and preventing high altitude sickness.1 In addition to Rhodiola rosea, over 200 different species of Rhodiola have been identified and at least 20 are used in traditional medical systems in Asia, including R. alterna, R. brevipetiolata, R. crenulata, R. kirilowii, R. quadrifida, R. sachalinensis, and R. sacra. Rhodiola rosea has been categorized as an adaptogen by Russian researchers due to its observed ability to increase resistance to a variety of chemical, biological, and physical stressors. Origination of the term adaptogen has been dated to 1947 and credited to a Russian scientist, Lazarev. He defined an “adaptogen” as an agent that allows an organism to counteract adverse physical, chemical, or biological stressors by generating non-specific resistance. Inherent in his definition is the concept that administration of the adaptogenic agent allows an organism to pre-adapt itself in a manner that allows it to be more capable of responding appropriately when diverse demands are eventually placed on it. In 1969, Brekhman and Dardymov proposed specific criteria that need to be fulfilled in order for a substance to qualify as an adaptogen. To successfully combat stress and stressful situations, adaptation is required. Adaptation might be best thought of as the ability to be exposed to a stressor, while responding with either decreased or no characteristic hormonal perturbations. Adaptation also implies being prepared to and capable of rapidly reassuming homeostasis after the stressor is withdrawn. As an example, a well-trained athlete can participate in an event that would induce a large HPA perturbation (stress response) in a sedentary person, and yet the athlete will be relatively unaffected. This is a result of adaptation that has occurred during the athlete’s training process. Additionally, if athletes are exposed to stressors they were not trained for, hormonal perturbations characteristic of a stress response would be expected; however, this response might not be as great as that found in less fit individuals. Furthermore, after the stress ended, their physiology would be expected to re-establish homeostasis rapidly. This is a result of non-specific resistance to stress gained by virtue of a training-induced higher level of fitness. Brekhman II, Dardymov IV. New substances of plant origin which increase nonspecific resistance. Ann Rev Pharmacol 1969;9:419-430. Linh PT, Kim YH, Hong SP, et al. Quantitative determination of salidroside and tyrosol from the underground part of Rhodiola rosea by high performance liquid chromatography. Arch Pharm Res 2000;23:349-352. Lee MW, Lee YA, Park HM, et al. Antioxidative phenolic compounds from the roots of Rhodiola sachalinensis A. Bor. Arch Pharm Res 2000;23:455-458. Ohsugi M, Fan W, Hase K, et al. Active-oxygen scavenging activity of traditional nourishing-tonic herbal medicines and active constituents of Rhodiola sacra. J Ethnopharmacol 1999;67:111-119. Visioli F, Galli C, Bornet F, et al. Olive oil phenolics are dose-dependently absorbed in humans. FEBS Lett 2000;468:159-160. Bonanome A, Pagnan A, Caruso D, et al. Evidence of postprandial absorption of olive oil phenols in humans. Nutr Metab Cardiovasc Dis 2000;10:111-120.
de la Puerta R, Ruiz Gutierrez V, Hoult JR. Inhibition of leukocyte 5-lipoxygenase by phenolics from virgin olive oil. Biochem Pharmacol 1999;57:445-449. Boon-Niermeijer EK, van den Berg A, Wikman G, Wiegant FA. Phyto-adaptogens protect against environmental stress-induced death of embryos from the freshwater snail Lymnaea stagnalis. Phytomedicine 2000;7:389-399. Stancheva SL, Mosharrof A. Effect of the extract of Rhodiola rosea L. on the content of the brain biogenic monamines. Med Physiol 1987;40:85-87. Lazarova MB, Petkov VD, Markovska VL, et al. Effects of meclofenoxate and Extr. Rhodiolae roseae L. on electroconvulsive shock-impaired learning and memory in rats. Methods Find Exp Clin Pharmacol 1986;8:547-552. Udintsev SN, Shakhov VP. The role of humoral factors of regenerating liver in the development of experimental tumors and the effect of Rhodiola rosea extract on this process. Neoplasma 1991;38:323-331. Udintsev SN, Schakhov VP. Decrease of cyclophosphamide haematotoxicity by Rhodiola rosea root extract in mice with Ehrlich and Lewis transplantable tumors. Eur J Cancer 1991;27:1182. Germano C, Ramazanov Z, Bernal Suarez M. Arctic Root (Rhodiola Rosea): The Powerful New Ginseng Alternative. New York, NY: Kensington Publishing Corp; 1999. Darbinyan V, Kteyan A, Panossian A, et al. Rhodiola rosea in stress induced fatigue ¬ a double blind cross-over study of a standardized extract SHR-5 with a repeated low-dose regimen on the mental performance of healthy physicians during night duty. Phytomedicine 2000;7:365-371. Baranov AI. Medicinal uses of ginseng and related plants in the Soviet Union: recent trends in the Soviet literature. J Ethnopharmacol 1982;6:339-353. Hiai S, Yokoyama H, Oura H, Yano S. Stimulation of pituitary-adrenocortical system by ginseng saponin. Endocrinol Jpn 1979;26:661-665. Fulder SJ. Ginseng and the hypothalamic-pituitary control of stress. Am J Chin Med 1981;9:112-118. Altern Med Rev. 2001 Jun;6(3):293-302.